(Nanowerk News) Both high-valued diamond and low-prized graphite consist of exactly the same carbon atoms. The subtle but nevertheless important difference between the two materials is the geometrical configuration of their building blocks, with large consequences for their properties. There is no way any kind of material could be diamond and graphite at the same time. However, this limitation does not hold for quantum matter, as a team of the Quantum Many-Body Physics Division of Prof. Immanuel Bloch (Max-Planck-Institute of Quantum Optics and Ludwig-Maximilians-Universität München) was now able to demonstrate in experiments with ultracold quantum gases. Under the influence of laser beams single atoms would arrange to clear geometrical structures (Nature: "Observation of spatially ordered structures in a two-dimensional Rydberg gas"). But in contrast to classical crystals all possible configurations would exist at the same time, similar to the situation of Schrödinger’s cat which is in a superposition state of both “dead” and “alive”. The observation was made after transferring the particles to a highly excited so-called Rydberg-state. “Our experiment demonstrates the potential of Rydberg gases to realise exotic states of matter, thereby laying the basis for quantum simulations of, for example, quantum magnets,” Professor Immanuel Bloch points out. The experimental work was supported by theoretical model calculations performed in the group of Dr. Thomas Pohl (Max Planck Institute for the Physics of Complex Systems, Dresden). The experiment begins with cooling an ensemble of a couple of hundred rubidium atoms down to temperatures near absolute zero and catching the atoms in a light trap. The atomic cloud is then superimposed with a periodic light field – a so-called optical lattice which provides an almost uniform filling in the central region of the trap. In the next step laser light is applied to transfer the atoms into a Rydberg-state in which the outermost shell electron is located at a huge distance from the atomic nucleus. As a result, the sphere of influence of these atoms is blown up, like a balloon, by a factor of about 10 000, reaching a comparatively “huge” diameter of several micrometres – about the size of a tenth of the diameter of an average hair. 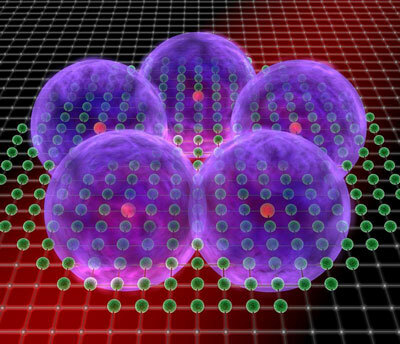 These super-atoms now interact strongly via so-called van der Waals forces, which act over a long range. As soon as the system undergoes an observation the superposition collapses into a specific geometric configuration of Rydberg-atoms, in analogy to the famous example of Schrödinger’s cat which is found, once it is observed, either dead or alive. 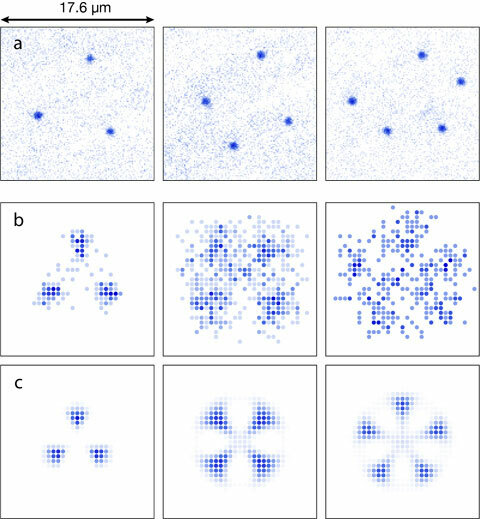 In a series of “snap shots” of such configurations the scientists revealed the different patterns of the individual excitation states. This is possible by using a special technique which images each Rydberg-atom directly with very high spatial resolution. “We observe the emergence of spatially ordered excitation patterns with random orientation, but a well defined geometry,” Peter Schauß explains, who works at the experiment as a doctoral candidate. In order to recognize the fundamental structures the individual images are grouped according to the number of Rydberg-atoms. Typical microscopic configurations are shown in figure 2. Three atoms are arranged on an equilateral triangle, four or five atoms form quadratic or pentagonal configurations. The experimental data was in good agreement with numerical simulations of the many-body dynamics which were performed by the group of Dr. Thomas Pohl. A future challenge for the scientists is the deterministic preparation of Rydberg crystals with a well defined number of excitations. Combining the blockade effect with the single-atom addressing one could engineer quantum gates which can serve as an experimental toolbox for a variety of quantum simulations. Several Rydberg-atoms could be connected to a scalable quantum system for quantum information processing.